Continued from 25 March 2019. Fast forward to to 2014. The reissue of 30 Days… indirectly led to Kelly, Sciotto and Lafferty eventually writing and recording their second album, Evil Men Do, 23 years later. This is a huge improvement on the debut, clearly playing on experience. The writing is sharper, the punchlines impressive and the arrangements endlessly inventive. But it was totally out of time and disappeared without a trace. Only re-emerging now. While it’s initially underwhelming it effortlessly creates a bridge with the past, and rewards repeated listening. It feels like one long, multipart song, full of the maturity and wisdom that comes only with experience. It’s ballad heavy, but that suits the mood and the circumstances. It pivots around four key tracks, ‘From The Fire’, ‘The Evil That Men Do’, ‘Blame It On The Moon, and ‘Stagefright’ The upbeat optimism of the debut’s circumstances is long gone, replaced now by a philosophical urbanity of tone and content… the title of the album speaks loudly of the band’s experience over the years. 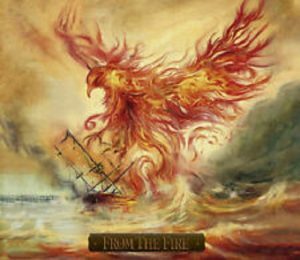 The song ‘From The Fire’ has an accusatory “end of the innocence” spark, stripping away the veneers of right wing political narratives,and the gospel undercurrent running through ‘Blame It On The Moon’ ebbs and flows like life itself. The Floydian, Freudian ‘Stagefright’ is the real centrepiece though. A beautifully constructed ballad that leans on a lush Beatlish arrangement, c.Magical Mystery Tour, and searing, Gimour-esque soloing. This is the “worth buying the boxset for” album. Artistic impetus took Kelly and Lafferty back into the studio in 2015, leading to the creation of third album, OctOpus. The late Jimi (Survivor) Jamison had been something of a hero to JD Kelly, and much has been made of ‘You Will Survive’, his tribute to one of the pre-eminent vocalists of Melodic Rock’s mid eighties zenith. It’s an ode to a man he never met. It’s well intentioned, but lacks intimacy and therefore doesn’t really work. That said, many of these songs are cast in the Survivor mould. From the throwaway poprock of ‘Perfume and Leather’ to the raucous, self contained ‘Requiem’. But ‘That’s How Love Starts’ is the one that really works here. The solemn, church organ intro, the piziccato strings, the cinematic, Giorgio Moroder production and arrangement… to all intents and purposes this song is Part Two of Survivor’s memorable rock ballad, ‘Across The Miles’. Its themes, both musically and lyrically, feel like blood relations of this much covered ballad. It’s a touch of musical sophistication that strikes a lot of chords. And as tributes go, it’s pretty cool. In other news, the Powerpop ‘Every Beat Of My Heart’ is worth a mention. It could have been constructed of spare parts from the recordings of Jellyfish and Badfinger, and that’s no bad thing. Where others have tried and failed, FTF have created a handsome monster indeed. The album closes with bonus track, ‘Here For Christmas’ – a heart tugging appeal to an estranged partner, with a movingly melancholy undertow. Hardly an upbeat ending. But sometimes Christmas is like that. It confirms the developing wisdom that this band is something of an enigma, progressively distancing itself from its AOR beginninings.